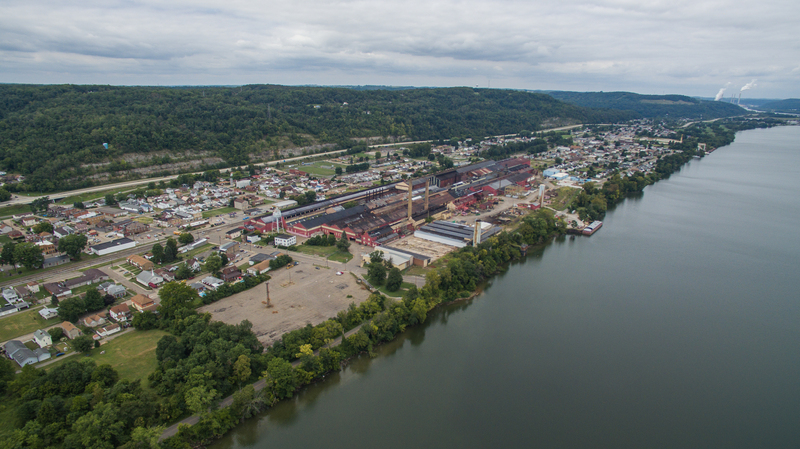 This industrial site, formerly a steel plant, is located just east of SR 7 along the Ohio River. The site is equipped with private rail service, full electric and natural gas service, as well as one harbor. There is approximately 500,000 square feet of building space available. Topography of the site is generally flat and vehicular access to the site is good. Topography of the site is generally flat. According USDA NRCS, there are two soil types mapped for the site. The two soil types that were mapped are Udorthents-Urban land complex (Ud – 1-acre, 1.5 percent of the site) and the Urban Land – Chavies complex (UsA – 65 acres, 98.3 percent of the site). There are small portions of the site that lie along the bank of the Ohio River that fall within the FEMA 100-year floodplain. The USFWS NWI map for the Yorkville Site does not depict any wetlands for the property. The primary vehicular access to the site is from Ohio SR 7, which in this location the road is four-lane in width. Access to the site involves exiting Ohio SR 7 onto two-lane public streets to actually access the main gate off of Public Road. Other access locations exist off of Medilla Avenue and Old Ohio SR 7. The site is located 7 miles from Interstate 70. There are both Wheeling/Lake Erie Railroad and Norfolk Southern railroad tracks located along the west side of the site. There are multiple spurs that enters into the site from the north/northwest that allow for stacking of many railroad cars. One spur accesses the northeast portion of the site; some of the tracks and ties need to be upgraded. 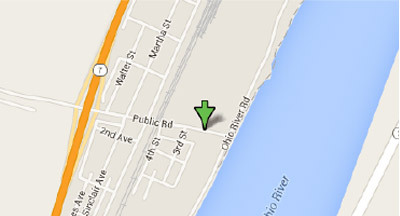 One docking facility exists along the Ohio River. The docking facility does not have a crane or conveyor. The docking facilities allow for the docking of one barge. The Pittsburgh International Airport is located 43 miles from this site, and it is 23 miles from the Jefferson County Airport. According to the USACE Ohio River Navigational Charts database, the river depths at the site range from 0 to 2.74 meters in depth near the shoreline and 2.74 meters deep or greater beyond. 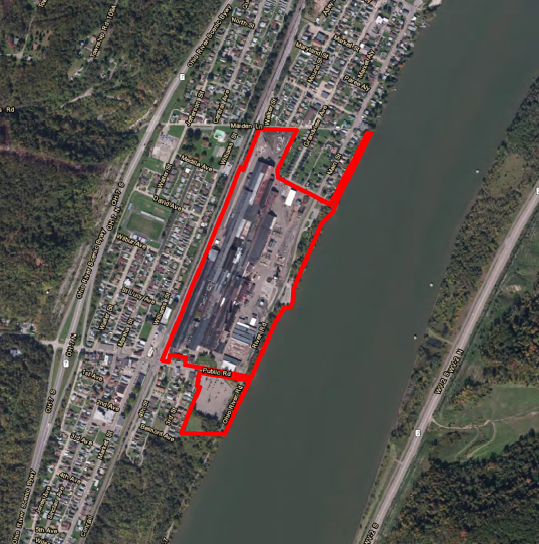 The Yorkville Site is located near Ohio River Mile 83, which has normal pool elevations of approximately 644 feet amsl. According to the ODOT Division of Planning, Maritime & Freight Program information database, there is one terminal location identified at the site at Ohio River Mile 83.4. Gas service is provided by Columbia Gas Company. The main gas service line extends along Old Ohio SR 7 and enters the site near the northeast corner. It then extends into the site where it is divided into distribution lines that service various operations throughout the site. Electric service is provided by AEP Ohio. 69kV & 12kV is on site. Additional 138kV and 69kV located within 0.2 miles. Potable water service is provided by both the Yorkville Water Works and the Village of Tiltonsville. The Yorkville Water Works potable water supply enters into the site from along Public Road at two locations, which are located on the south side of the site. The Tiltonsville potable water supply (6-inch diameter size) enters into the site from the north along Medilla Avenue. In addition to the potable water supply, there are two Ranney Collector Wells under the Ohio River that can produce 800 to 1,000 gallons per minute (gpm) for non-potable water/industrial usage. There are two raw water intakes that can produce 22,000 gpm for non-potable water/industrial usage. Sanitary sewer for a shower room only that is located on the south end of the site is piped off site and treated by the Village of Yorkville. Currently the storm drainage sheet flows into a storm drainage collection system and the storm water is discharged into the Ohio River at multiple outfall locations. There is a process WWTP that treats industrial wastewater and it is located at the northeast corner of the site. The treated water is discharged into the Ohio River.